WHAT a delight that double bassist Cairns, after 25 years of being a stalwart in others’ bands, chose to lead such a talented ensemble playing his compositions. There is no chordal instrument in the line-up — Michael Jordan on drums, Stephen Grant cornet, Don Stewart trombone and Adam Simmons tenor sax — but luxuriant harmonies mingle with melodies and timbres to create moods variously dark, spirited and humorous. In Platform 2, the horns set up a succession of resplendent echoes, the ‘bone and sax soft and sumptuous, the cornet plaintive and occasionally chattering, giving a vital edge. Cairns, a sousaphone player who grew up on church brass bands, values the expressive power in the interplay of horns and uses it. 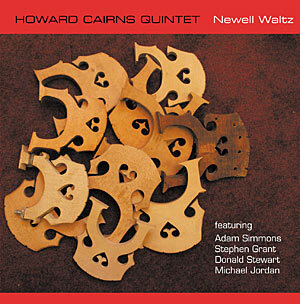 This entry was posted in CD REVIEWS and tagged Adam Simmons, CD review, Don Stewart, Howard Cairns, Howard Cairns Quintet, Michael Jordan, Newell Waltz, Stephen Grant. Bookmark the permalink.